George Romero's fifth zombie film makes the disappointing LAND OF THE DEAD look a whole lot better. 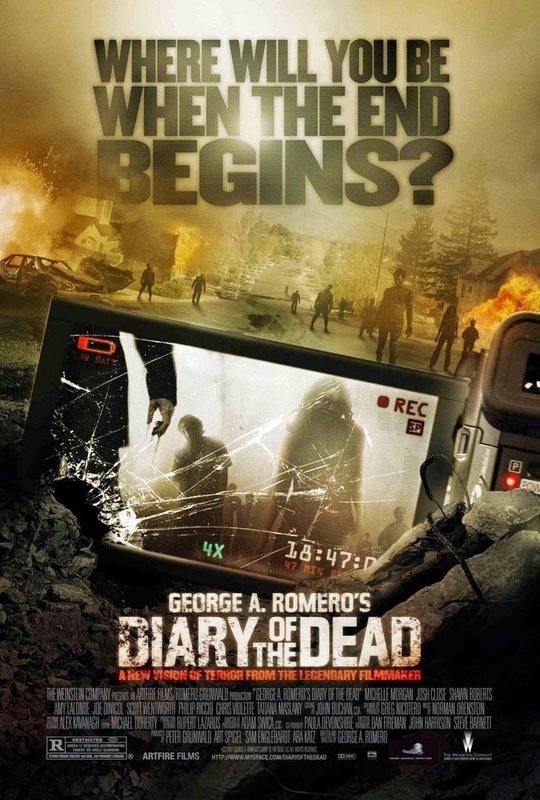 In DIARY OF THE DEAD, Romero reboots the series, and tells the story of a group of film students who end up documenting the onset of the zombie plague. Along the way they encounter a comic relief Amish mute, a group of pseudo-Black Panthers, and of course, hordes of the undead. The problem with DIARY OF THE DEAD is that Romero completely eschews the kind of characterization that made films like MARTIN and DAWN OF THE DEAD great in favor of some very heavy handed messaging about media, journalistic ethics, exploitation of human suffering, yada, yada, yada. At no point in this film did I care about any of these people, nor did I feel any sort of tension from the situations they find themselves in. It's as if Romero started to make a horror movie with a message and then forgot about the "movie" part of it. The "found footage" approach rarely works in a movie's favor, and in this one it feels completely artificial. One character even says she decided to add ominous music to make the footage seem more frightening. This line completely destroyed what goodwill Romero had left. After enduring CGI gore, annoying characters, and half-baked social commentary, this insult to the viewer's intelligence is too much to bear. DIARY OF THE DEAD was a real heartbreaker. I hope Romero uses what's left of his working life to make movies he wants to make, rather than be pressured into milking the zombie cow any longer. He's a brilliant filmmaker whom, I believe, has one more great movie in him. Labels: found footage, George A. Romero, Horror, Zombies Posted by Erik S.